Liquid Web Review 2019 - hint: They're awesome for WP hosting! In a nutshell, we definitely recommend Liquid Web for Managed WordPress Hosting. Let’s run through the main benefits we really liked. Security: Having an SSL certificate (https, a secure site) is a must these days, definitely with Google favoring https sites, and Chrome actively labeling non-secure sites as “not secure”… Liquid Web includes SSL certificates with their plans, just set and forget. Backups: No weekly or monthly backups, but daily backups! Did something wrong? No worries, just go back to yesterday. Automatic updates: Don’t fear the updates, they’ll do it for you while making sure nothing breaks. iThemes Sync: Great if you’re running multiple WP sites. iThemes Sync is included with every plan, this is a multi-site management system so you can make bulk changes to multiple sites. Support: 24/7/365 by phone, email and chat… and it’s true expert support! Honestly, we really like them! They’re solid, super reliable, and evolving with the industry. If you have the budget (they start at $99/mo), go for it! Liquid Web was founded by Matthew Hill in 1997. The company’s CEO, James F. Geiger started in 2015. They pride themselves in being #1, the Industry’s Best when it comes to Customer Loyalty. Currently, Liquid Web has over 30,000 customers spanning 30 countries. They have more than 500,000 sites under management and five global data centers. This USD 100+ million company provides a variety of products and services. 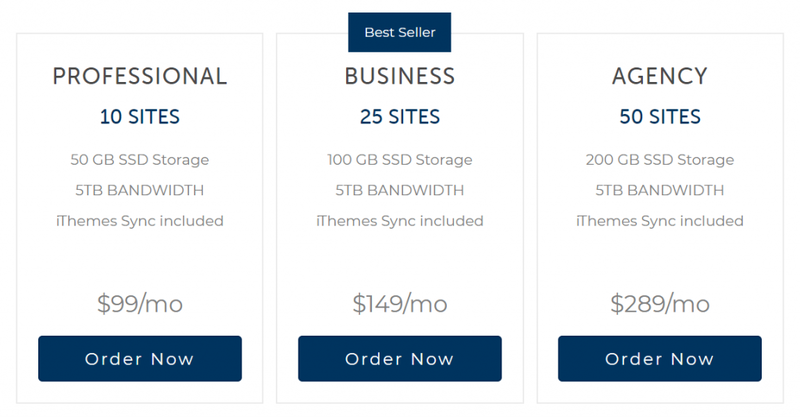 These include Dedicated Servers, Cloud VPS Hosting, Cloud Dedicated Hosting, Managed WordPress Hosting, Managed WooCommerce Hosting, and a variety of Custom Web Hosting Solutions, among others. Liquid Web have made Inc. Magazine’s annual list of 5000 companies for 10 years in a row. Talkin’ Cloud ranked them #7 out of all the cloud service providers. And according to Cloud Spectator, the company has the fastest managed VPS. The company takes compliance and security seriously. They have a variety of certificates published on their website to prove this. They comply with the EU-US Privacy Shield Framework and the Swiss-US Privacy Shield Framework. The company is also HIPAA Compliant. Finally, they also comply with the General Data Protection Regulation (GDPR). The cheapest plan is called Professional and costs USD 99.00 per month. Quite a lot! Though, the good thing about this is you can pay on a month-to-month basis. You are not obliged to enter into any contract and you can cancel anytime. This package allows you to accommodate 10 sites. You are also given 50GB worth of storage. This is limited compared to other hosting providers who given an unlimited amount of disk space. If you have 10 sites in one account and only 50GB worth of storage, this might not be enough. In cases where you have to place high-quality images, videos, and downloadables in your site, a limited storage space might not be for you. Automatic backups are done daily and stored offsite for 30 days. If you wish to restore this backup (in cases where you cannot fix a complicated problem on your site), you can do so with just one click. You are given an automatic SSL for every site you order from Liquid Web. This is given with no additional cost on your part. This means, you get to secure your own website and protect the sensitive information it contains. It also means a boost in search engine rankings since Google favors secure websites over non-secure ones. If you are just starting out with your website, you are given a staging platform. This means, you can test your site before it goes live. By testing your site, you can check out its look and feel and be able to detect problems before it goes out to the public. Liquid Web takes their Managed WordPress Hosting services seriously. They update your WordPress installation and ensures your plugins aren’t left alone. Liquid Web makes sure plugins do not conflict in your platform by automatically updating them in a separate environment. If everything is in order, then plugins are updated on the production site. iThemes Sync Pro is included as well. It gives you the ability to monitor your site’s uptime or downtime. It also allows you to view and track Google Analytics data. iThemes Sync Pro gives you the ability to check posts SEO status and control what your clients can actually see in the WordPress admin dashboard. These can all be done within a single location. Speed is given importance by using solid state drives (SSDs) instead of traditional mechanical drives. This means faster website loading speeds due to the use of the former as opposed to the latter. Images are also automatically compressed through and image optimization plugin. Again, this means, faster loading speeds due to lower image file sizes. You have no pageview or traffic limits with all Managed WordPress Hosting plans. Thus, you are not charged for pageview counts and you are not billed for overage fees. This is a good thing if you have a lot of website viewers and if peak season is coming up. When it comes to promises, they have a 100% network uptime guarantee. A big promise to make! They also have a 100% power uptime guarantee. Plus, they give you a 30-minute hardware replacement guarantee. The Knowledge Base contains tutorials that will help you keep your sites and accounts up and running. Support Tools include an IP Checker, SSL Tool, and a DNS Tree. The first one, IP Checker, allows you to view your device’s IP quickly. The SSL Tool allows you to check validity of SSL and other information. The DNS Tree tool gives you the ability to view DNS records in a tree diagram. Liquid Web promises a lot when it comes to their customer support service. Phone & Chat support is available 24/7 and according to them, you can get help within minutes. Initial response time guarantee for the help desk is 30 minutes. If they miss this 30-minute mark, they’ll credit you 10x the amount they missed it by. There is also a 30-minute hardware replacement guarantee. Once a faulty dedicated server hardware is found, it will be replaced within 30 minutes or less. If it takes more than the said guarantee, they’ll credit you 10x the amount of extra time. They promised a lot, right? But did they live up to it? According to most reviews, they actually did. Wow! Their customer support and technical support reps were very knowledgeable on both easy and complicated problems. And they were very happy to help the customers. This is a big plus for Liquid Web. They do not charge for pageview counts or overage fees. You can have an unlimited amount of traffic on your website and you won’t have to worry about shelling out extra money. They make sure that your website is up 100% of the time. If not, they’ll credit you 10x the downtime. They provide excellent customer support service that most customers loved. Plus, they’ll credit you 10x the amount they missed if they didn’t respond to HelpDesk tickets within 30 minutes. You get automatic daily backups which are stored off site for about 30 days. This comes in handy when your website gets into trouble. You can immediately restore the backup with one click. It’s easy as 1-2-3. You get an automatic SSL certificate for every site you order with Liquid Web.This means, you get to secure your website and enhance its rankings in search engines. That’s a double whammy! Aside from updating your WordPress website, plugins are also managed for you. Plugins are tested if they conflict with each other. This is done in a separate environment. If no conflict arises between plugins during the test, then it is deployed in the production site. Before you deploy your website, you have to make sure it’s in its optimal state. Thus, the free staging site allows you to test your site before going live. This ensures better user experience for website viewers. The least expensive Managed WordPress Hosting plan is at USD 99.00 per month. This is not a cheap price. If you are just starting out, you might not be able to afford the cost (but it’s definitely justified). They’re awesome, not much else to say. If you can spare the cost, you’ll never look back!